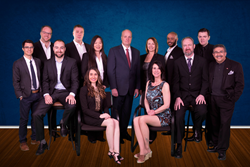 May, 2018 marked the 10 year anniversary of OVC, INC. Based outside of Chicago, Illinois, the company provides innovative and effective marketing solutions to law firms throughout the United States. Originally founded in 2008 by Greg Wildman as Online Video Concepts, LLC, the company offered video services to attorneys. Soon, requests for websites started coming in, and Wildman began building a team of developers, marketers, search engine optimization (SEO) experts, writers, and editors. In 2013, the company’s name was changed to OVC, INC. to reflect the wide range of services provided. After starting with a few clients in the state of Texas, the firm now provides services to law firms in 15 states. In the years that Wildman and his team have worked to provide digital solutions to law firms, OVC has compiled a package of offerings specifically designed to promote lawyers online. Through the combination of informative website content and blogs that follow best practices for SEO, reputation management, legal directories, click-to-chat services, pay-per-click(PPC) advertising, social media, and video, OVC is able to help attorneys connect with people and convert them into paying clients. OVC’s efforts have helped their clients show up online and generate millions of dollars in revenue over the past decade. To celebrate their 10-year anniversary, OVC, INC. will be offering product and service specials throughout the year. OVC, INC. was founded by Greg Wildman in 2008. From the start, OVC provided video production and website development to attorneys, and the company has continued to grow by offering products, services, and partnerships that help attorneys connect with their clients both online and offline. OVC’s commitment to doing the right thing for clients is what sets the firm apart, and the OVC Team works with attorneys to choose the right mix of products and services that will help them succeed, whether those offerings are provided by OVC, a legal directory or service, or another partner. To learn more about how OVC, INC. can create a winning digital marketing strategy for your firm, visit https://www.ovclawyermarketing.com/ or call 630-635-8000.